On a cold Saturday in December, some of the best and brightest college students in New England stood up in front of a panel of judges to share their sustainability recommendations and insights for small businesses. Seventeen students from six colleges enrolled in Manomet’s U360 internship program showed just how much they had learned over the course of the semester about business operations and sustainability—and more importantly, how to communicate. During the morning, six students from University of New Hampshire (UNH) and Suffolk University competed as one team. Ryan Mitchell from UNH won for the sustainability action plan he created for a t-shirt printing company. In the second session, the team was composed of five students from University of Southern Maine, University of New England (UNE), and St. Joseph’s College. The winner was Kaylin Keith from UNE for her work with a coastal New England coffee shop. Finally, the afternoon saw six students compete from University of Vermont. UVM’s winner was Alison Schwartz for her action plan for an independent chain of grocery stores. Why is that so important? “With the complex problems we face in the 21st century, there’s no more important skill we can have than being able to have a thoughtful conversation with another person—especially someone who sees the world differently from us,” says Hagan. Through our relationships and partnerships, Manomet seeks to have those conversations; these U360 interns are now able to go back to their schools and future careers prepared to tackle the complex sustainability issues that will need to be solved by their generation. This event couldn’t be possible without the expertise, experience, and unique perspective of the judges—they asked excellent, challenging follow-up questions after each presentation, and the interaction between them and the students really rounds out U360’s full-circle learning that occurs between business leaders and the next generation throughout this program. Thank you to all of our esteemed judges: Phil Coupe, ReVision Energy; Mac McCabe, Sustainable Business Consultant; Leah Soloway, U360 Student Finalist, Spring ’17; Fiona Wilson, UNH Center for Social Innovation and Enterprise; Rich Grogan, NH Small Business Development Center; Nick Masiello, U360 Next Generation Award Winner, Spring ’17; Cathy Lee, Lee International; Joe Walsh, Green Clean Maine; and Edie Allard, U360 Student Finalist, Spring ’17. There are two upcoming opportunities to see U360 in action this spring. 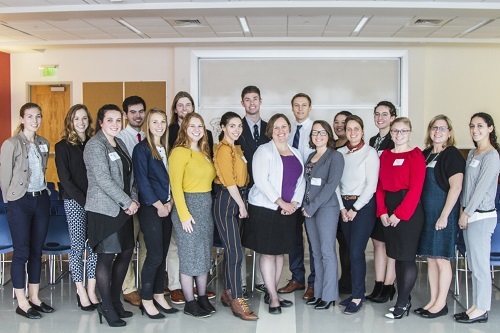 The 19 college students participating in the internship this semester will all present their Sustainability Action Plans at our preliminary competition on Saturday, April 28th at University of Southern Maine in Portland. Three finalists will be selected that day to advance to our final Business Sustainability Student Competition on Thursday evening, May 3rd at the Harvard Club in Boston. Save those dates!